Nicola is a leader of and mentor to Unbound women. She is from Southampton in the UK, but now splits her time between there and Rochester in upstate NY. She is a trained Hypnotherapist and coach and has worked with hundreds of women worldwide to overcome blocks and shift limiting beliefs, so they can achieve their goals. 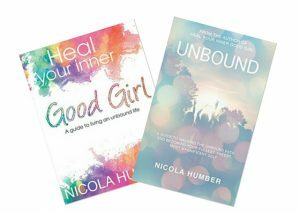 Nicola has written two books, her first “Heal Your Good Girl” and has just released her 2nd book “Unbound”.